Early freedom seekers in the Edenton area, like abolitionist Harriet Ann Jacobs, had to make use of North Carolina’s coastal “maritime underground railroad,” to escape slavery. Calvin and Jerry’s sojourn to Norfolk was likely made a little easier by the Union’s capture of Roanoke Island in early 1862. In his enlistment record, Calvin was described as thirty years old, five feet, nine inches tall, with black eyes, complexion, and hair. Little brother Jerry was documented as twenty years old, five feet, six inches tall, with black eyes, complexion and hair. 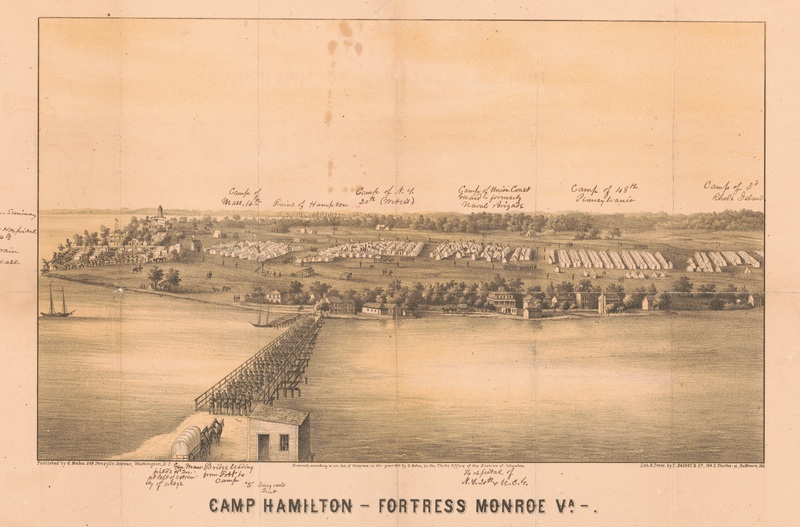 Both men mustered in on December 22, 1863, at Camp Hamilton, where the 1st United States Colored Cavalry was originally organized. In his pension record, Calvin described his military service as best as he could remember it. He noted that the regiment was involved in a small skirmish “on the turnpike near Petersburg,” though no one in his company was injured. He remembered traveling to Bermuda Hundred, arriving after the battle was over, and being before Petersburg, Virginia, though he didn’t join the fight. Later, he remembered moving on to Williamsburg, Virginia, and being in Richmond after April 3, 1865, when the state capitol fell to Union forces. In the city for only a few days, his company was ordered from Richmond to Geddes (Gettys) Station (Portsmouth, Virginia), and then on to Brazos Santiago, Texas. It was during the trip to Brazos Santiago, Texas, that Calvin remembered the beginning of what would become permanent issues with his eyesight. Whether from smoke, dust, or exposure, he explained it as “just a loss of sight.” In his enlistment record, he was recorded as being absent from duty on August 3, 1865 as a result, with an eventual transfer to the Corps D’Afrique General Hospital at New Orleans, Louisiana soon after. On December 22, 1865, he was discharged from duty on a surgeon’s certificate of disability. He soon returned to Tidewater, Virginia. Having no major medical issues, Calvin’s brother Jerry remained in Texas with the regiment when Calvin was discharged. Calvin lived with Jerry’s family in Hampton, Virginia until early 1867. After Jerry’s return to Hampton Roads, Calvin relocated from Hampton to Portsmouth, and met Hannah Barnes, who became his common law wife. Hannah was also from North Carolina, and by 1870, the couple were documented in the Western Branch district of (former) Norfolk County, Virginia. Two daughters were born to them, Martha in 1872, and Rachel Ann in 1874. During this period, Calvin worked as a general laborer, eventually becoming an oysterman, like many of my paternal ancestors. Over in Hampton, Jerry officially married Rebecca (surname unknown). The couple had seven children, daughters Louisa and Rachel, and sons Robert (or Richard), Edward, Jerry, Jr., William, and….Calvin. Jerry White, Sr., worked mostly as a general laborer, in lumberyards in and around Hampton, and later as a gardener. Pvt. Calvin White passed away on December 31, 1921. His wife, Hannah, and little brother, Pvt. Jerry White, preceded him in death. Hannah died sometime after 1900, and Jerry, on April 13, 1910. Calvin was laid to rest in Portsmouth’s Mount Olive Cemetery by Richard Rodgers, a son of a Civil War veteran, and noted African American undertaker for Portsmouth’s black community. To date, a headstone for Pvt. Calvin White has not been found. It’s possible that he never had one. It is also possible that he did, and his gravestone, like so many others in the cemetery complex, is simply buried out of sight by a foot or more of soil, a victim of repeated bouts of flooding and soil disturbance over the years. Calvin’s wife Hannah may also be buried in Mount Olive, but like her husband, without an identifiable gravestone.